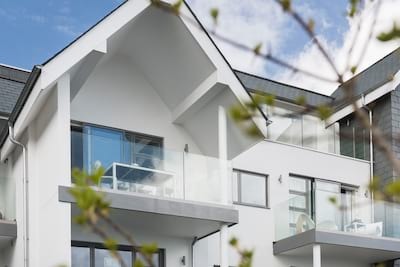 Add a little coastal chic to your holiday beside the sea and stay in style at Ocean Cliffs. 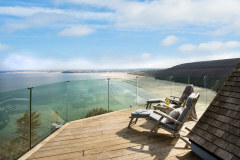 Set in a prominent location overlooking the golden sands and blue surf of Porthtowan, North Cornwall, this newly created luxury penthouse is no ordinary holiday home. Ocean Cliffs offers 3 beautiful bedrooms and 2 contemporary bathrooms. 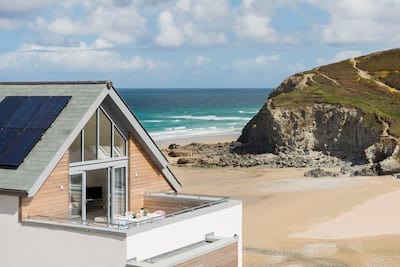 A large open plan living space is set to a coastal view backdrop with ample space for all to relax, unwind and enjoy the Cornish way of life. For the ultimate holiday indulgence the outside hot tub is well placed. Enjoy the luxury of the location as you wander from holiday door to sandy shores in moments via the private beach access. Private allocated parking. This smart modern penthouse has been recently completed to the highest of standards, from the moment you arrive the superior standards and attention to detail set the luxury scene. A central hallway leads to the open plan living, dining and kitchen space flooded with natural light and wonderful sense of tranquility. This generous space is perfect for families and friends to gather as a holiday group in all seasons from cosy fireside chats as the winter storms blow to lazy summer afternoons as you watch the comings and goings of beach life below. Dress the dining table up for celebrations to remember or simply enjoy a post surf lunch on the go. The wonderfully stylish kitchen inspires a Cornish menu packed full of local ingredients, get creative for a slap up meal. 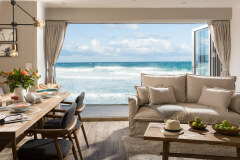 Choose from 3 stunning boutique bedrooms each with a unique decor twist from the cool vintage surf prints, rustic french greys and coppers of the master bedroom to the modern fixtures and fittings. The contemporary bathrooms are no less considered offering a luxury haven for the perfect soak. Ocean Cliffs oozes individual style and brings a more relaxed ambiance to the smart building through the thoughtful styling and inspiration of a local interior designer. Salvaged and reclaimed furniture belnd flawlessly with more modern order whilst original Cornish images and maps evoke the charm and character surrounding North Cornwall. 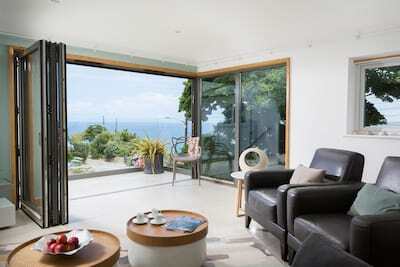 From the living space, slide back the glass doors to reveal the wonderful decked balcony and oh what a view! This large outside space becomes a welcome extension to holiday living in the warmer months. A bespoke built in seating area ensures al fresco dining. Soak in the hot tub after a day of exploring, this jackpot position really has to be the best on the coast. 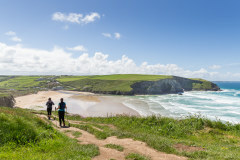 Private beach access leads straight onto the golden sands of Porthtowan via the steps and pathways. 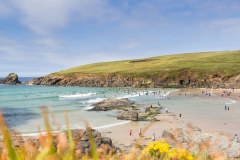 Porthtowan really is a jewel in the North Cornwall beach crown offering something for everyone from cool laid back beach bar, some of the best surfing waves in Cornwall to the scenic beauty of the high cliffs. 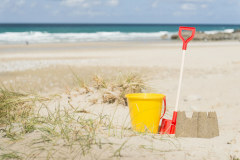 A newly rennovated childrens playground is just minutes from your holiday home. 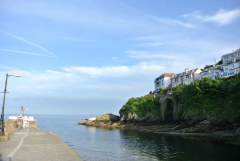 This very unique corner of Cornwall is waiting to be explored, head West to the popular harbour town of St Ives or enjoy the calmer waters and quieter coves of South Cornwall. Ocean Cliffs is a home from home; stylish, relaxing and thoughtful. 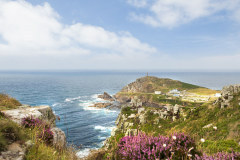 Choose to stay in the heart of North Cornwall. Private hot tub - Please note that the water in the hot tub will be changed for each new guest arrival and therefore may take a few hours to come back up to temperature. There is little-no mobile phone coverage in this location. Please check with your carrier for further information. The photos gave a perfect representation of the gorgeous apartment. A beautiful property with stunning views. We had a superb holiday. Thank you. The property was excellent - well equipped, very clean, great views. Would love to stay here again. A fantastic holiday and a great place to stay! Luxury apartment in an outstanding location. We really enjoyed our stay at Ocean Cliffs , this property was perfect! I found the booking process excellent and simply adored the property. I will definitely be booking Ocean Cliffs again! I had the most fabulous stay.Thank you Cornish Gems for your excellent work, keep it up! Amazing location, fabulous penthouse. We had a blissful week and the weather was terrible, but it didn't matter at all. We walked in the rain and came back and lit the fire and watched the waves crashing below against the cliffs. A spectacular holiday and we will definitely be booking again. Thanks both to the thoughtful owners for providing such a lovely place to stay and to Cornish Gems for being so helpful and easy to deal with. This was an unforgettable place to stay. The property was stunning. Not just because of its unforgettable location but because of every beautiful detail that had been thought of. It was a work of art! The way the furnishings were so in keeping with the surroundings - every little detail was a delight. And the appliances! The kitchen, the shower, the sound system - it had the best of everything. It felt like no corners had been cut it was all the best of the best. It was spectacular. From the website I had the highest of hopes and yet somehow being there in the flesh surpassed it. I can not stop raving about it and trying to arrange another time to return. I wish I was there right now! We were blown away by the position of ocean cliffs, hot tub and the space for a family of six was excellent. 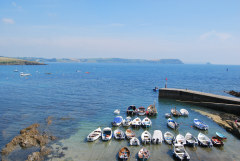 We enjoyed our stay and have already recommended Cornish Gems to many friends. The accommodation was outstanding and the location could not have been better for a beach holiday. The service from Cornish Gems was excellent. 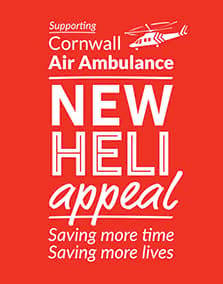 We will definitely use Cornish Gems again. Thanks. Ocean Cliffs is a beautiful apartment, very comfortable, stylishly decorated and well equipped and with stunning views. Our family holiday there was very memorable, and the hot tub was a big favourite. I also found the Cornish Gems staff very helpful at all times.